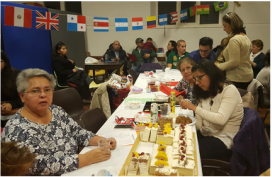 Providing FREE English classes is a central component to ﻿Latin American Disabled People's Project (LADPP) mission; encouraging and facilitating closer ties between individuals and the wider community in London. We hold English lessons for various competency levels basic, intermediate and conversational. Classes are held in our offices throughout the week. We hold guitar classes every Tuesday 3 pm - 4 pm, in our offices. Progress is made for learners from basic skills to a full rhythm accompaniment. If you suffer from a disability that limits your participation in certain activities, don't be put off! At these classes you can develop exercises for movement and rhythm which result in many therapeutic benefits. Classes delivered by Eduardo Ugaz, user-volunteer. Get in touch to find out when the next class is on and learn how to play this great instrument. An extremely popular activity at LADPP, with the number of people who regularly participate in this class being excellent. It's not just the learning of new knitting techniques which makes this activity great, but also the friendly environment that is created - where users get together and have a gentle chat with friends. The FREE knitting group meets every Friday 11 am - 1 pm, and provides an excellent social meet and learning experience - we'd love to have you! We organise Community Gatherings, Social and Cultural events to bring all of our users, their carers, families and friends, and the local community together. Some of our regulars are LADPP Annual General Meeting (AGM), Family Forum, Family Day, summer trips, LADPP Anniversary and our Christmas Party. Don't forget to keep﻿ up-to-date.